Atheist slogans: one fewer god than you? I came across it yesterday, not for the first time, but maybe the 21st. Quoted as if it was significant and telling. You have almost certainly seen it too. The quote is attributed to Stephen Roberts1. It is cute and sounds clever, but does it actually say anything? If the original quote can be taken seriously, then this response is an effective counter. But I’d prefer to actually analyse the saying. Why do I believe in the God of Jesus? I believe the impartial historical evidence shows that we have good information about what Jesus did and taught. On the basis of that evidence, I believe that Jesus was the son of God and was resurrected, and therefore has the authority to teach us about God. I don’t believe there is any comparable historical evidence to support that any other prophet of God or guru was the son of God and was resurrected, and therefore none has as much authority and truth. So a significant reason I believe other descriptions of God are inferior to the christian description is because they don’t recognise Jesus as the son of God and resurrected. So if Roberts’ slogan was true, he would have to disbelieve in the God of Jesus for the same reason – namely that christianity disbelieves in Jesus as son of God and resurrected. But that is contradictory, because christianity does believe that. The slogan is contradictory. There are good reasons to disbelieve in christianity, just as there are good reasons to believe. People disagree over the merit of those reasons. But to assess the truth requires careful consideration of the historical and philosophical evidence. This slogan tries to bypass that. I think anyone who uses it without doing the hard yards of presenting their case isn’t really serious. And anyone who does present a well-reasoned case doesn’t need such a question-begging slogan. Afterthought: do I dismiss all the other possible gods? I believe there is only one God. Many people have tried to describe God, and I have no doubt that some descriptions are more accurate than others. I believe Jesus gave the most accurate teaching about God, and where others teach the same things about God I believe they too are correct. For example, Muslims believe God created the universe – I believe they are correct. Muslims believe God is merciful and approves people who are merciful to the poor – and so do I. Muslims believe God doesn’t have a son so Jesus wasn’t the son of God – but I disagree. Overall, I guess I might agree with about half of how Muslims describe God. So I don’t “dismiss” other gods, I believe people have made partially or mostly inaccurate description of God. But I am not an atheist regarding those descriptions of God, I simply disagree with some parts of those descriptions. Is that how Stephen Roberts disbelieves? Does he simply disagree with some or most aspects of all descriptions of God, while agreeing with some? Again, the slogan doesn’t work. Interestingly, the quote has been attributed to several different people named Stephen Roberts. GoodReads infers Roberts is the author of several books on computer modelling, but this appears to be simply opportunistic advertisements for a different Roberts. Wikiquote, based on a comment by Sam Harris, says the author was “Australian historian Stephen Henry Roberts”. But on Ask Atheists, a Stephen F Roberts claims to have originated the quote. Despite some searching, I have no way of knowing which claim is right, or who Stephen Roberts is. 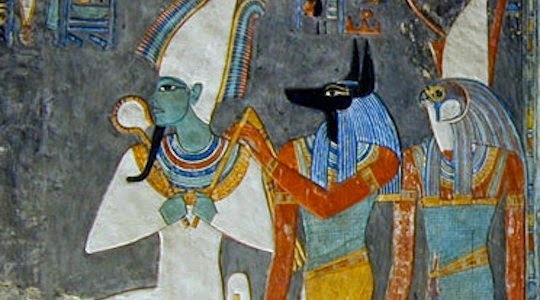 Picture: From the tomb of Pharaoh Horemheb, showing the gods Osiris, Anubis and Horus, in Wikipedia. Original photo modified by A Parrot. « No more! No more!